It's no surprise that managers, HR gurus, and the media misinterpret this new generation. The Millennials are nothing like the earlier generations of Boomers or Gen Xers. With Boomers on the verge of retirement, organizations are gearing up to hire large numbers of young Millennial employees—a fact that has most employers throwing up their hands. Complaints about this incoming generation abound. A 2009 Pew Research Center study found that a majority of older Americans believe today’s young adults are inferior to them in moral values, work ethic, and respect for others. Each month, media stories criticize Millennial employees for everything from poor grammar and short attention spans to flip flops and Facebook breaks. 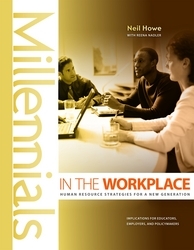 In his new book "Millennials in the Workplace: Human Resource Strategies for a New Generation" leading generational expert Neil Howe turns this downbeat message on its head. Managers and the media have it all wrong, contends Howe: Today’s rising youth workforce is not a liability and a challenge, but an asset and an opportunity. A national speaker and best-selling author, Neil Howe is America’s foremost expert on generations. Howe has coauthored many bestselling books with William Strauss, including "Generations" (1991), "The Fourth Turning" (1997), and "Millennials Rising" (2000). His "Recruiting Millennials Handbook" (2000) served as a guidebook for every branch of the U.S. military. "Millennials Go to College" (2003, 2007) has earned him speaking invitations at every major collegiate association, and "Millennials and the Pop Culture" (2006) is helping the entertainment industry navigate the shoals of its fast-changing market. "Millennials in K-12 Schools" (2007) explains the new youth and parental expectations to K-12 teachers and administrators. The original coiner of the term “Millennial Generation,” Howe has redefined how America thinks about its post-Gen-X youth. His work on Millennials has been featured on CBS's "60 Minutes" and the PBS "Generation Next 2.0" special by Judy Woodruff. Howe and his longtime co-author William Strauss co-founded LifeCourse Associates, a publishing, speaking, and consulting company built around their generational discoveries. LifeCourse Associates has served over two hundred clients in a wide range of sectors—from Nike to Merrill Lynch, from Disney to the U.S. Marine Corps, from MTV and Paramount Pictures to the American Petroleum Institute and Ford Motor Company. A dozen federal agencies have turned to LifeCourse for strategic help, as have over a hundred colleges and K-12 school systems. More information is available at our Media Kit page. "No More 'McJobs' for These Young Adults." Today’s young employees have short time horizons and can’t wait to “job hop” at the first opportunity—or at least that’s the perception. Turns out it’s a misperception, and one that is seriously hurting employers. Surveys show that most Millennials want to bond with an employer who will partner with them to achieve lifelong career goals, and typically job hop only when they’re convinced that their employer is not offering the right long-term opportunities. In his new book, Neil Howe explains how top employers have stopped high turnover by showing their commitment to young workers’ long-term career paths and offering variety in a structured environment. "Is the 'Me Generation' a Myth?" Everyone’s heard the assertion: Millennials demand unrealistic praise and encouragement from managers because they are entitled, egotistical, and self-oriented. A new book argues that this “me generation” trope is nothing but a myth. Yes, these young workers want tight cycles of feedback, explains author Neil Howe—but only to ensure that they’re doing exactly what their managers want. The Millennials also want to bring a culture of recognition into workplace environments that they see as far too cynical. So are “employee of the day” ceremonies here to stay? Howe explains how some employers are ramping up a new kind of feedback that raises the tone of the organization without inflating egos. "With Millennials, 'Soft' Skills Don't Have to Mean Hard Times for Managers." Many managers believe that Millennial employees disrespect the rules of the office. Why else would they dress inappropriately, show up late, chatter on cell phones, and flub formal business letters? But according to Neil Howe, the problem is not disrespect. Millennials have never been taught “soft” workplace skills like appropriate dress and communication, or don’t know when or where to apply them, explains Howe. By understanding the real problem, employers can actually do something about it. Howe’s new book brims with examples of how employers have remedied soft-skills deficiencies by developing explicit policies about required dress and behavior, and by formally training young workers.